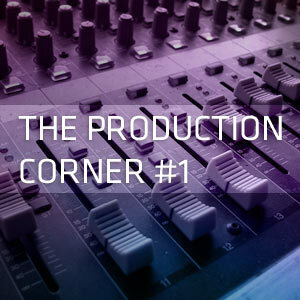 Welcome to the production corner ! Electronic music is breaking through at the moment, crossing genres and blending into many styles, thus these are exciting times to give you an insight of the production process. I’m Pedro Bliss and I’ll be guiding you into the thrilling and intricate world of electronic music making. Chances are that you don’t know me yet, as I’ve been pretty quiet on the release side, but rather busy behind the scenes working on many projects ranging from sound effects for theatre pieces to complete soundtracks for short films, but also tech house originals and remixes. If you’re a music junkie, you’ve probably wondered at some point how the stuff gets done, just like a gourmet loves to learn about the recipes. In these monthly episodes, I’ll try to give you a good picture of the production process. So, how do you make an electronic music track ? Before the 90s, producing electronic music required a good deal of hardware and ingenuity. Then computers came in, with sequencers such as Cubase, which allowed you to write complete songs. Pro Tools was a revolution : tapes were no longer needed to record audio, that could happen directly into the computer. From then on, the whole game started to change. Synthesizers that only existed in hardware forms, began to have digital counterparts. It was pretty clear : sooner or later, everything would eventually happen “in the box”. That’s why today, there’re skilled wizards who are able to put out complete tracks, with the sole help of a computer and a pair of headphones. You may have heard the terms “bedroom studio” and “home studio”, and these are pretty accurate depictions of the reality. You don’t need much gear to make music today, because what used to need a complete infrastructure is now packed into a Digital Audio Workstation. This is the hub to modern music production : it allows you to play and record sounds, edit them, mix and master them. The DAW actually does most of what required much hardware in the past, and that’s a hell of a piece of software. People like Avicii for example, do everything on the computer, that’s why a common misconception comes in the form of “it’s computer made”. He’s a great example because he’s a really fast worker. What’s interesting in his approach is that he’s using the “building blocks” technique. Essentially, he will write a chord progression using a keyboard connected to the DAW, or writing the notes directly on the screen in what’s commonly referred to as a “piano roll”. Then, he’ll repeat the process for as many elements as needed, and create an arrangement, with effects and variations. Most of electronic music producers work this way. But what about a more conventional approach, with actual recordings ? Some do it as well. Fred Falke for example, records real synths and bass/guitar into the computer. Then, thanks to the flexibility of its DAW, he can use them with elements he created inside the computer. People like Alan Braxe use older hardware machines, known as samplers, to build up the track, and use the computer as a recording and finishing tool. PS : This series are not meant to be overly technical, so if you’re already familiar to the subject, but you have some advanced questions, feel free to post them in the comments. Also, if you’ve any particular topic on your mind, shout out : even though I’ve a pretty good idea of where we’re going, there’re still some free spots for requests. Great article mate, really cool.